Make Music Day took over Nashville as part of a international day aimed at providing free music performances and education to anyone who wants to participate. One of the first events on Tuesday was at Hadley Park Library, where members of the Nashville Symphony hosted a symphony “petting zoo” where students were able to try their hand at the instruments played on stage by some of Nashville’s finest musicians. “Even before they touch the instrument, they just point it out and say, that one’s mine,” Kelley Bell with the Nashville Symphony said. The Nashville Symphony holds events similar to this “petting zoo” throughout the year and decided to participate in Make Music Day in hopes they could inspire someone to make music a bigger part of their life. At the Nashville Zoo, that same mentality came into play as they hosted a petting zoo of their own. Even though it was at the zoo, no animals were involved, instead, people were invited to play harmonicas thanks to Make Music Nashville, the Nashville Zoo, and Hohner. In Nashville, what would Make Music Day be like without country music and guitars? The Country Music Hall of Fame and Museum made sure that answer wouldn’t have to be pondered as they hosted free guitar lessons for anyone who wanted them. The Country Music Hall of Fame and Museum provided guitars to each person as well as a guitar pick, and by the time the lesson was done, those participating could play three chords and play at least one Country classic. 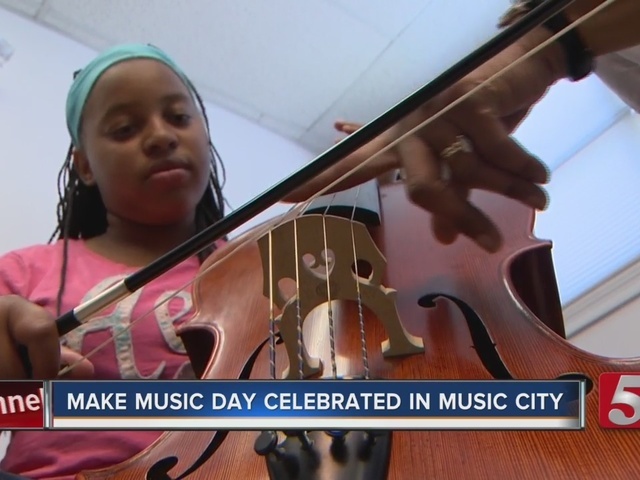 While Make Music Day is just one day every year, organizers with Make Music Nashville as well as those who volunteered to host events hope that what was learned and what was displayed will help bring music into peoples’ lives throughout the entire year.